The two-month-old heir to Japan's throne, Prince Hisahito, has been presented at a Shinto shrine in the grounds of the imperial palace. Dressed all in white, he was carried to the shrine for the ceremony, which is a tradition among Japanese families. His mother Princess Kiko told gathered reporters that Prince Hisahito is known as "Yu-chan", a pet name based on one of the Chinese characters of his name. His birth solved a succession crisis in Japan where only men can be monarchs. Prince Hisahito, the son of Emperor Akihito's second son, Prince Akishino, was the first male born into the royal family for 41 years. He is third in line to the Chrysanthemum Throne after Crown Prince Naruhito and Prince Akishino. 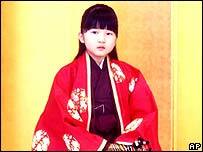 Crown Prince Naruhito and his wife, Princess Masako, have a daughter, Princess Aiko, who is four-years-old. Before Prince Hisahito's birth, Japan's former Prime Minister Junichiro Koizumi had been advocating constitutional reform to allow women to ascend to the throne. But the debate, although supported by the public, was shelved when news of Princess Kiko's pregnancy was announced. Japanese babies are often presented at the Shinto shrines shortly after their birth and periodically throughout their childhood. Shinto, an animistic belief system, is the ancient, native religion of Japan. "This is a ceremony similar to the shrine visits carried out by other families," a palace spokesman said. "It is not limited to heirs to the throne." "Prince Hisahito has been growing up in good health without getting sick. On sunny days his mother often strolls around the palace garden with him," the Imperial Household Agency said in a statement. The prince, who has two sisters, was later taken to visit his grandparents the emperor and empress.